Link to the Pikes Peak region: Co-author Joseph Michelli is a fixture in the Colorado Springs community. He’s a radio talkshow host 4-6 p.m. weekdays on KVOR (740 AM), fielding conspiracy theories with aplomb. Book signing: Noon Oct. 2, Poor Richard’s Bookstore, 320 N. Tejon St.
Michelli was working on a book about businesses that use humor to expand profits. He studied Southwest Airlines, Ben & Jerry’s and then arrived at the World Famous Pike Place Fish Market. After interviewing market owner John Yokoyama, the idea for a chapter became the idea for a book. Michelli functioned as a super-scribe, interviewing Yokoyama for hundreds of hours over the course of a year. “My goal was just to listen and tell Johnny’s story,” Michelli said. The book was bought by the first publisher to read it. Technology allows Michelli to travel the nation and conduct his live show from hotel rooms anywhere. Synopsis & Review: This is the story of the World Famous Pike Place Fish Market in Seattle. You know these guys — the fishmongers who toss huge salmon to each other. 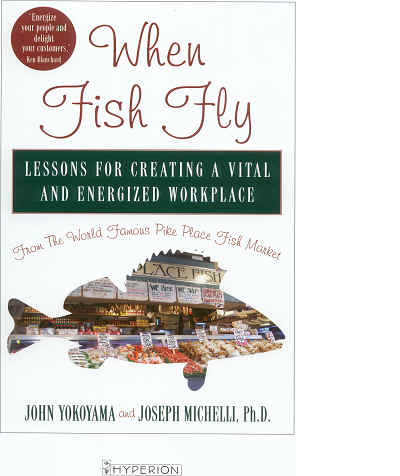 The market was an ordinary, 1,200-square-foot storefront for 20 years, until owner John Yokoyama decided to create a “world famous” enterprise, a place that happened to sell fish on the way to bringing joy to its employees and customers. This book is not a feel-good story, but a practical guide for businesspeople. A series of nine lessons walk the line between psychology and management training: creating a vision, forming a team, being rather than doing, managers changing themselves first (“the fish stinks from the head”), the art of listening and so on. The ideas aren’t original, yet they’re lent power by the concrete example of Pike Place. And although Yokoyama’s philosophy may seem starry-eyed, his profits say otherwise. So far, Publisher’s Weekly and Booklist have reviewed it positively. Michelli says his psychology background dovetails well with his study of organizations that work. He described the World Famous Pike Place Fish Market as a “working lab” for many of the psychological principles he tried to teach individuals. Vitals: Published by Hyperion, $19.95, 158 pages Where you can buy it: Major booksellers Listen instead: “When Fish Fly” also is available on CD from Random House. The abridged, two hour version packs in the core lessons in a quick dose. What’s next? Michelli wants to write more books about the great lessons of great businesses. His next target is Starbucks Coffee Co. CONTACT US: If you are publishing a book soon, let Bill Reed know at reed@gazette.com or call 636-0226.